I have often seen school gardens with vibrant, beautiful chard leaves left to wither. How sad! 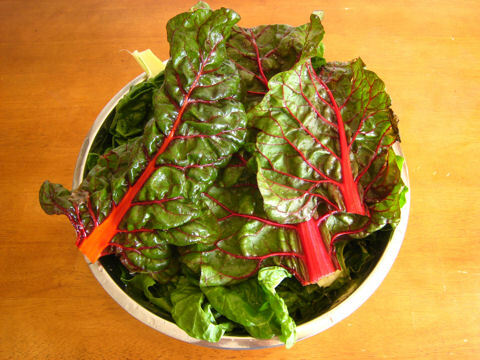 Chard belongs to the same family as Spinach (Amaranthaceae), does not have a chalky taste, and can often be used in spinach recipes. This recipe (an adaptation of one of the many variants of Boston Market Creamed Spinach) can be modified in many different ways, including as a creamy sauce over baked chicken or pork, sprinkled with buttered bread crumbs! Fresh chard leaves from garden, about 1 very large bowl (about 1.5 gal/6 litre capacity). I don’t use stems but these can be set aside for a stir fry meal. Harvest a very large bowl of chard leaves and steam till cooked but not overdone. Overcooked chard or spinach is yech, so it’s best to undercook. You just want the leaves to soften. You should end up with at least 2 cups of chard. Let drain and cool. Chop them up in large chunks so they’ll be easy to mix in with the sauce. Make a roux: Melt ~6 tablespoons of butter. Add ~3 tablespoons of flour. Mix well. Then add 1.5 – 2 cups of chicken broth or milk or a mixture of both. Mix well till smooth. Then add about 1/2 cup grated Asiago cheese (Parmesan, Romano, Gruyere also do fine). The consistency should not be too thick/heavy or too watery. In a separate pan, heat about 4 tablespoons of olive oil. When hot, add minced garlic and diced onions till golden or caramelized. Add the chard and saute about 3-5 minutes. Slowly add the roux and mix well. Taste before seasoning with any additional salt. Add spices like pepper and nutmeg to taste. The publicity surrounding the White House garden just hit The New York Times yesterday, and is spreading like wildfire among avid vegetable gardeners. We took a peak at the layout as spec’d by Assistant White House Chef, Sam Kass. Check out Plangarden layout of proposed White House veggie garden! There’s way too much spinach! How about some easy-to-grow bok choi? And once July comes around, the four beds of spinach will have to be replaced by something, hopefully a light-feeding, heat-tolerant veggie. Perhaps a late harvest heirloom tomato. Speaking of which … where are the TOMATOES? What about potatoes? Bush 😉 and pole beans? Cucumbers? Bell peppers? Green onions? Corn? Gosh, these are no-brainer, sure success veggies. Malia and Sasha are sure to enjoy cherry tomatoes through the early autumn. With all that nitrogen-hungry spinach, crop rotation has got to be in the plan as well. We suggest that at least two different plans are created: one for early, and one for mid-season. The First Family is sure to enjoy garlic in their meals, so that’s a good one to plant in October. We seem to be missing items mentioned in the NYTimes article like the tomatillos, hot peppers and basil. An oversight, perhaps. So what do you think about Sam Kass’ proposed layout? 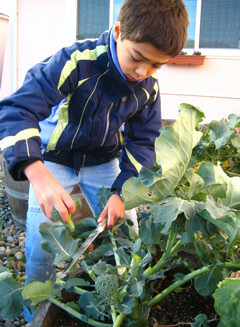 Kids love veggie gardening together! There are many benefits in introducing children to grow their own food. Parents and educators may wish to help develop responsibility, a sense of accomplishment and contribution to the home, as well as give kids the opportunity to see the magic of watching something grow. Your motivations will be your own, but I encourage you to grow vegetables with your kids. You’ll need to consider these suggestions in light of what grows best in your area. For instance, melons don’t do well in our cool, foggy summer climate, so alas, we don’t bother growing them. Lastly, make sure your kids have ease of access to their gardens – either in containers or narrow beds. Remember they’ve got more limited vertical and stretch reach. It isn’t much fun having to bushwack your way to get to a bean! Root crops like radish help break the top crust and is a good companion to carrots. Kids may not swoon over the taste, but radishes grow quickly, and allow your little ones to quickly make a contribution to the dinner table. Carrots are an age-old favorite which kids can munch on as they learn to thin the rows. Sugar snap peas, strawberries and cherry tomatoes are wonderful “pop-in-your-mouth” food right off the vine or with a quick rinse of water. Pole beans are fun to trail along teepees, and delicious raw and cooked. We grow a purple variety (“Royal Burgundy”) that turns green when steamed – a “doneness” indicator! Fresh, sweet corn can’t be beat (even munching it straight off the stalk), but it takes lots of nitrogen. There’s nothing like the sweetness of home-grown melons, if you’re lucky to have both the space and climate to grow them. They will require lots of water, but little ones will love harvesting their desserts! Tall, majestic sunflowers are impressive to little kids. 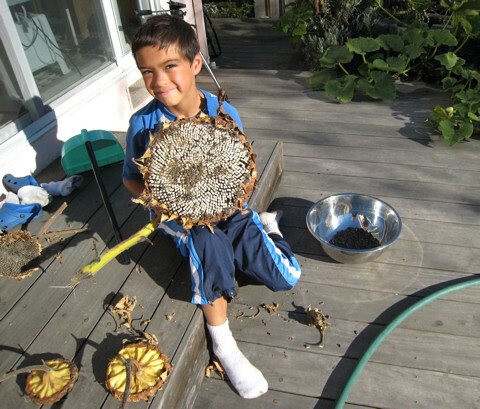 The hour or two to harvest seeds is a great bonding opportunity on a balmy Indian summer day. When it’s time to dig out the potatoes, our son invites his neighborhood friends to find the “Easter eggs”. 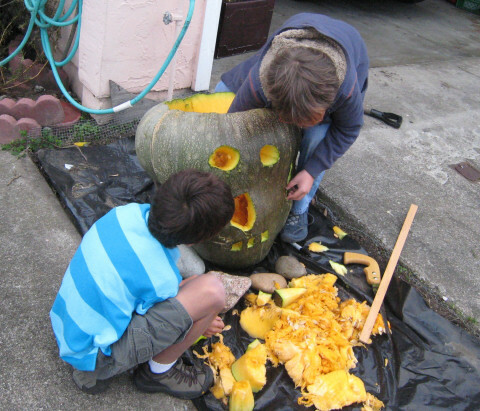 Pumpkins and gourds can take a lot of room in a garden, but if you’ve got a spare patch that can be left to cultivate the fruit over 4 months, your kids will love to show them off to their friends and schoolmates! Next up, the “Top 10 Least Desireable Veggies For Kids To Grow” ! 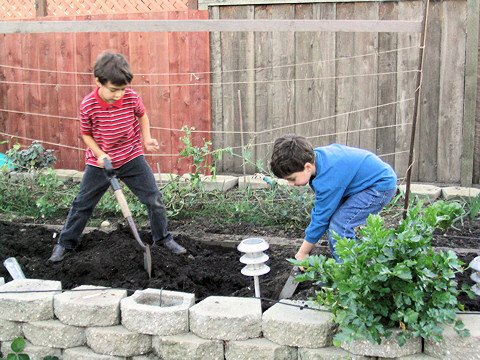 One of the rewarding pastimes of vegetable gardening is observing how much fun kids have digging in the dirt, planting seeds, and best of all, harvesting the fruit! We hope our readers will have opportunities to be involved in their community or school gardens as we had at the HEAL Project from our school district. They’ve successfully built veggie gardens over the last 2 years at three of our local elementary schools. We’ve also enjoyed visiting the School Garden Wizard site for its practical advice and resources in planning vegetable gardens for organizations. If you operate a school or community garden, please let us know. We offer Plangarden software at significant discounts to non-profits!